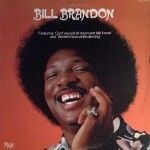 One of Southern Soul’s most criminally underrated and unsung heroes, Bill Brandon cut some of the genre’s finest singles for a host of labels in the late ’60s and early ’70s. His full-throttled, raw vocal style – somewhat reminiscent of Johnnie Taylor – makes all of them essential listening, especially considering that he recorded many of these gems in Muscle Shoals. This compilation brings together the best of those sessions in Alabama, stretching a nine-year period, kicking off with the old time classic “Self Preservation“, a deep soul ballad later also covered by Percy Sledge, and its original flipside “Full Grown Lovin’ Man“, a fatback funky romper, both from 1967. “Rainbow Road” probably is the most awesome deep soul belter here; a haunting little jewel set to a dark, brooding, slow groove, featuring eerie, ghostly backing vocals and a forelorn trombone. When it was released on single in 1968, it was backed with another fast-paced, horn-y strutter, the irrestistible “(You’ve Got That) Something Special“. In 1969, Brandon recorded a couple of tracks that, for reasons unexplained, remained in the vault for decades: the deliciously dreamy “Little by Little“, the ridiculously catchy “All I Need Is You” and the slow burner “When You Get What You Want” are all primo quality soul. Demonstrating his skills as a blues wailer, Brandon is equally at ease with the blues warhorse “Since I Fell for You” and the slightly jazzy “Strangest Feeling“, both from a 1970 session. In 1972 Brandon scored a R&B hit with the decidedly Johnnie Taylor-esque soulful rocker “Stop This Merry-Go-Round“, which was backed by another one of the man’s much praised slow ballads, the intense “I’m a Believer Now“. Two more singles were released that year: the downhome, introspective “Johnnie Mae Wright” was coupled with the glossy “Whatever I Am, I’m Yours“, and the bodaciously funky “I Am Free of Your Love” came with a unorthodox take on Erma Franklin’s “A Little Piece of My Heart“. With 1973’s “It’s All Wrong, It’s All Right” Brandon waxed one of his finest ballads, if not his very best; a very moody, soberly arranged, beautifully sad piece. It was flipped with the bouncy rocker “Doing Right Don’t Wrong Nobody“. Cutting two duets with Lorraine Johnson in 1974, “Let’s Make Our Love Something Special” and the dance jam “Let Me Be Your Full Time Groover“, Brandon eventually was one of the few soul survivors who had the opportunity to keep recording bona fide Southern Soul. On this disc, his greatest achievements of 1976 are brought together: the super funky “The Streets Got My Lady” has a slight but not intruding Philly-groove, but his mid-tempo ballads “Tag, Tag ” and “Good Guys Don’t Always Win” are very southern in their execution. Concluding this awesome set is the laid-back groover “Let’s Get It Back Together Again” and one more previously unissued nugget, the wonderful ballad “I’ll Be Your Puppet“. Super Southern Soul here… I’m glad I’ve come to know Bill Brandon’s small but consistently superb body of work… you will too.